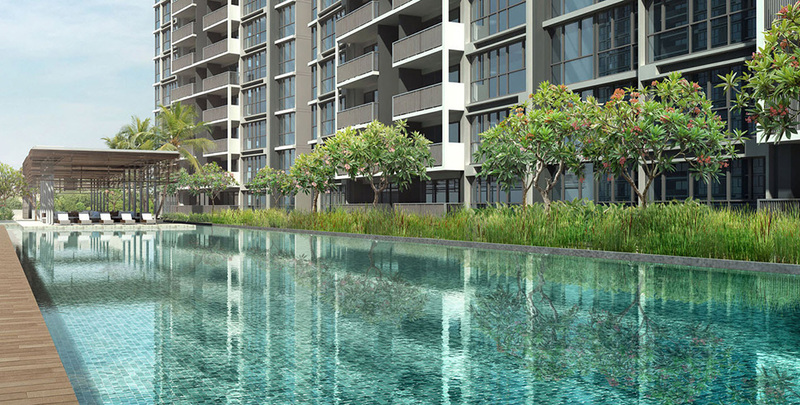 The price of executive condo in Singapore is determined by two main factors, the land cost for which developers bid for, as well as the developers cost (and profit margin). As a potential buyer of an executive condominium, it is certainly useful to know how the price is derived. With this knowledge, one can give a good estimate on future executive condominiums that will be launched based on the easily accessible market information. Selling price = $700-$850 psf ppr. Being a form of subsidised housing, the price of EC in Singapore will be lower than private condominiums in the surrounding area. This is because the government subsidises the cost of the land sale to ensure the selling price of the executive condominium will be affordable. As a general yardstick, executive condominiums are priced about 20% lower than the prices of comparable, private condominiums launched at the same time in surrounding areas. For example, if there is a private condominium launched at $1100psf, an executive condo launched at the same time in the same area may be selling from $750-$850psf. However, do note that is just a general guide and there are many other factors that affect the price of executive condo. As of 2013, the prices of ECs in Singapore have been slowly creeping up. While previously executive condos were sold at $700-$800psf (2011, 2012 etc), since the middle of 2013, the average selling per square foot price by developers has reached $800 and is set to be higher in the range of $800-$900 based on the new land price paid by developers. This translates to a estimate price of around $650,000-$750,000 for a 2 bedroom unit and in excess of $800,000 for a 3 bedder in future. where to check the EC price and sqft? Hi, can I check when if executive condominiums are generally more expensive after the e-application launch or there are no difference whether I buy during or after the launch? Thank you for your question. Depending on the response of the entire executive condominium project, the developers may increase prices after the E-Application launch. In general, it’s always best to purchase with an E-Application because that is when the developers usually give the most discounts, and you have the first ‘bite of the cherry’, the first choice of units. If you were to buy it after the E-Application launch, choice units may be taken up by those who register during the E-Application period already. Subsequently, prices may go up and units with the best facing etc would have been taken up. As an example, Lake Life EC was last reported as having 1,200 E-Applicants. For buyers who do not register during this period but are keen to buy, may find that the best units would have been taken up by these people who have priority over them. Furthermore, E-Application is a free procedure. With regards to getting trusted property salesperson to help you, let us know as we work with selected agents who focus solely on EC projects.